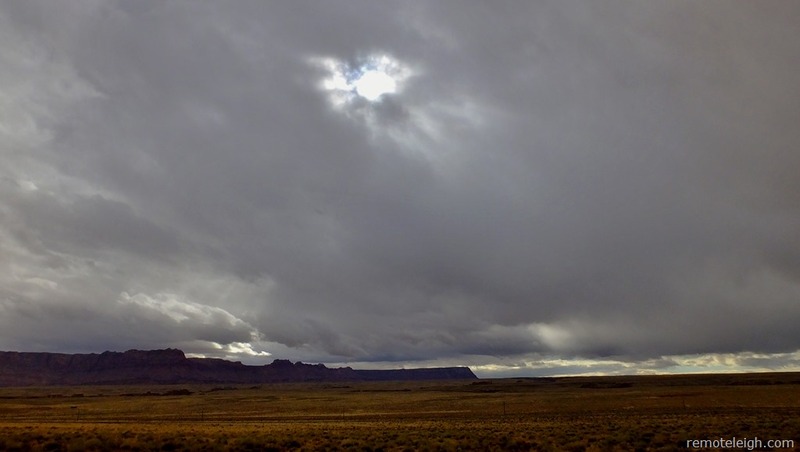 At the end of Utah’s Highway 316, lies three hundred million years of geological activity and an opportunity to stand on the edge of the world. Eroded by wind, water, frost, and gravity, the Goosenecks of the San Juan River are a living testament to the earth’s skeleton. The Goosenecks are a series of tight loops that geologists refer to as entrenched meanders. Weaving back and forth for over five miles, the San Juan’s meanders measure one linear mile. Beyond the visible Goosenecks, the San Juan River continues to twist and turn before spilling into Lake Powell. In my opinion, the Goosenecks are Utah’s answer to Arizona’s Horseshoe Bend, but without the crowds. After setting up camp, the Perfect Stranger, Shadow, and I cautiously walked along the canyon’s rim towards the Goosenecks observation point. The one thousand foot drop of geological madness to the silty San Juan River left me awestruck. Feeling awestruck has as much to do with how we look at the world as it does with the world we are looking at. Could being in love cause mother nature’s metamorphosis to appear more magical? 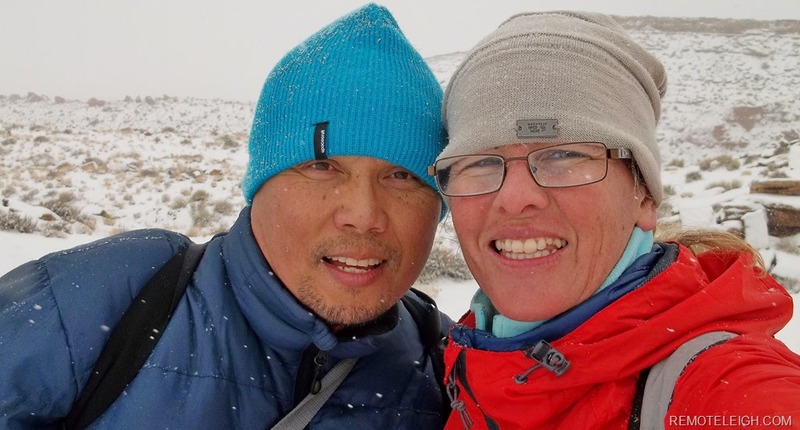 Does sharing awestruck moments reveal a couple’s capacity for wonder and surprise? Can awestruck moments serve as markers to the sacredness of time and life? Sharing awestruck moments with the Perfect Stranger reminded me of our beginning and mother nature’s role in the ever-developing story of us. On a personal level, mother nature feels like the family I never had. She has been present for every adult birthday, seasonal holiday, personal milestone, heartaches, heartbreaks, and professional achievements. Mother Nature fills the void of not having family. Having no direct experience of going home for the holidays or sharing holidays with family members leaves me feeling awkward, out-of-place, and downright uncomfortable. Celebrating seasonal holidays in a traditional way feels very foreign. I do not feel the same happiness or joy that others seem to be experiencing. It’s no wonder I have opted to spend holidays backpacking or camping. I’m with family and it’s familiar. For this reason, sharing adventure trips with the Perfect Stranger is sacred to me. I’m taking her home to meet the family! Under the watchful eye of Shadow, the Perfect Stranger carefully navigated her way down to a rocky outcropping. Standing guard, Shadow disapprovingly watched as the Perfect Stranger ventured down the canyon wall towards the precipice. Standing on the edge of the world, the Perfect Stranger, the love of my life, found herself in an awestruck moment. Captured in her natural habitat, these moments bridged the distance between the remoteness of the landscape and the connection I felt to her. Awestruck moments require connection with mother nature as opposed to the conquering narrative we have manifested in our minds. Does this sense of conquer originate from within? Mountain climbers frequently describe the physical and mental struggles endured in summit attempts. Does the internalized sense of struggle and the intense feeling of accomplishment evolve into a conquering state of mind? Is it ignorance or arrogance that fuels our sense of conquer? 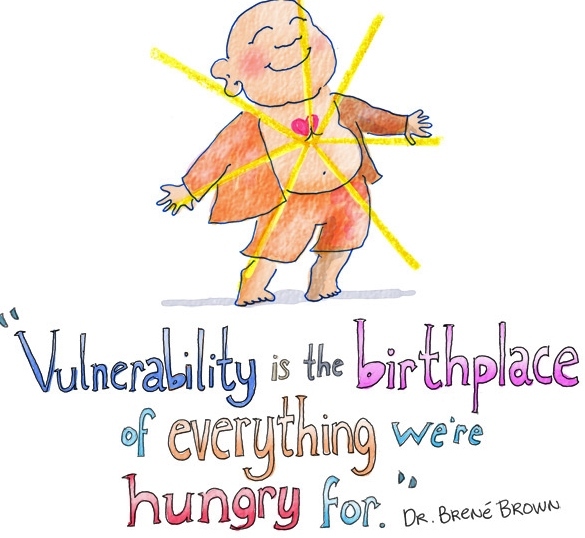 Perhaps a connection to the planet reveals one’s vulnerability to self and others. Returning to camp, the Perfect Stranger, Shadow, and I ate a light dinner while patiently waiting for the sun to set. Outside of the gentle breeze, the world felt remarkably still. For the next hour, the Perfect Stranger and I bathed in the pink, orange, and purple hues that painted the Monument Valley skyline. There was no one here, it was the off-season; a time when solitude can be found. In the final twilight minutes before darkness, mother nature saturated the sky with brush strokes of pink and purple. Mother nature’s canvas was complete, signaling the end of our day. After surviving a cold windy night, I was happy to get up and share my morning coffee with the sandstone buttes in the distance. Twenty-four hours ago, the Perfect Stranger, Shadow, and I were exploring the dirt back roads of Monument Valley. This morning, I had a base camp with a view. In a few hours, we would be leaving a state park that possesses the greatest example of an entrenched meander in North America. A state park that resides at the end of a highway. A state park that many a road tripper has unknowingly and unwillingly driven by. 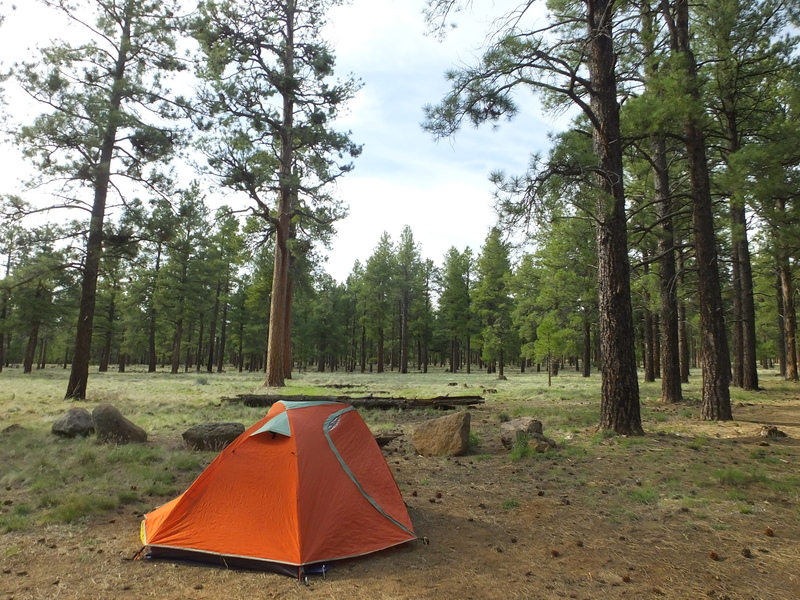 A state park without hiking trails, shade, or water. A state park that allows you to dance on the edge of the world. 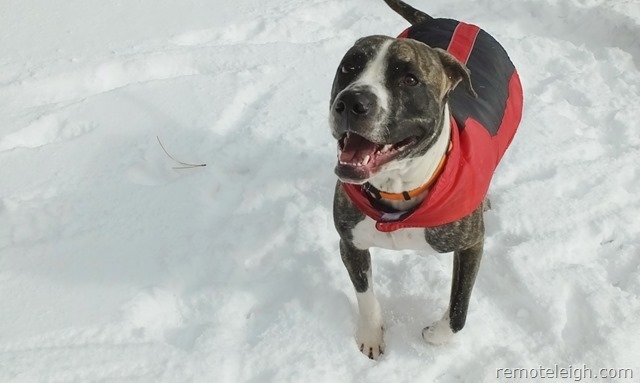 How do you tell your dog that the snowstorm is over? It’s rather simple, take him outside! With my cup of coffee and camera in hand, I settled into the snow as a spectator. For the next few hours, I had the pleasure of capturing Shadow explore his world. Shadow and I shared a very adventurous 2014. Together, we experienced the many faces and flavors of Vermilion Cliffs. 2015 was already looking bright. As a team, we experienced our first snow storm together. I could only hope he had as much fun as me! Have you ever spent an entire night chatting on the phone with a love interest? What starts as a well-intentioned goodnight phone call slowly evolves into an endless conversation about life and love. Is it commonality that bonds two humans over the phone or is it the soothing sound of a familiar voice? Is love founded in chemistry and bonded in chemicals? What fuels a marathon long phone call? Could oxytocin be to blame? Can the social bonding love hormone be activated during phone conversations? I am saying YES because I felt chemically altered after hanging up the phone with the perfect stranger. So altered, that I could not believe my eyes when I let Shadow outside to use the bathroom. 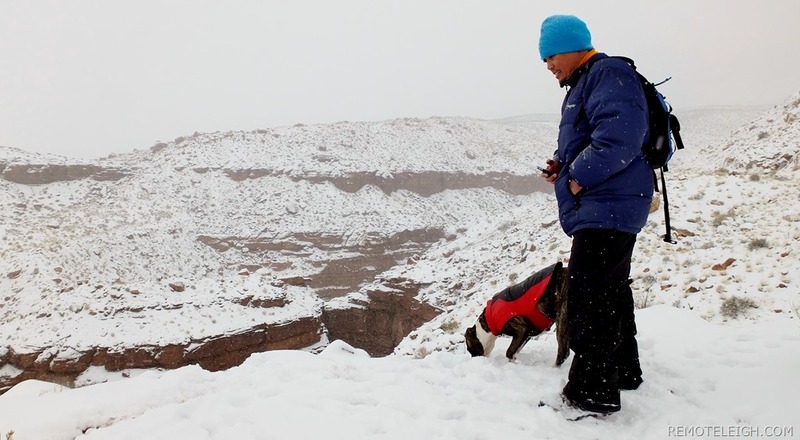 I saw snow; it was snowing in the desert! 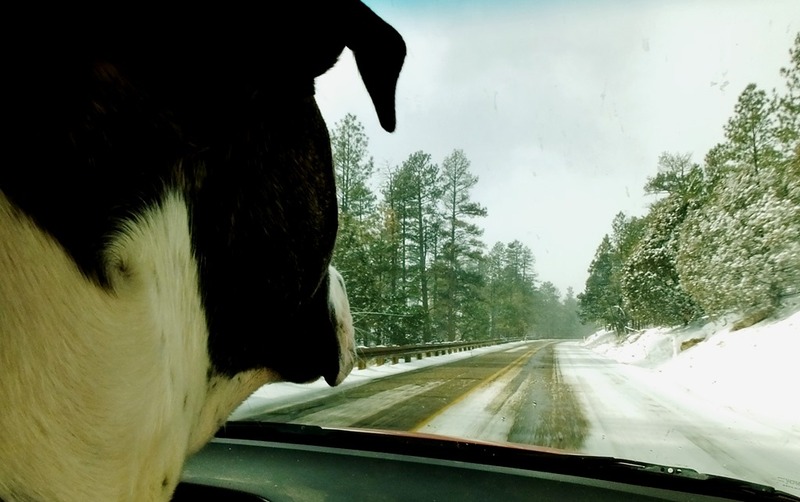 Shadow and I left the front yard and headed over to Highway 89A. Being off season, there were no tourists traveling along the road. Vermilion Cliffs lay quiet from a population standpoint. The majority of seasonal workers had gone home for the winter. All that remained was a handful of staff members and a few local residents. This is what the dead of winter looks like in a remote outpost town. After our slippery walk along 89A, Shadow and I returned home to have some coffee and banana bread with Min. As tired as I felt, I decided to stay up for the day. Sleep could wait, there was so little time and too many photo opportunities. Snow outside my back door was a dream come true! Just before noon, Min, Shadow, and I headed through the backyard towards the cliffs. Based on the weather report, the storm would continue for another thirty-six hours. 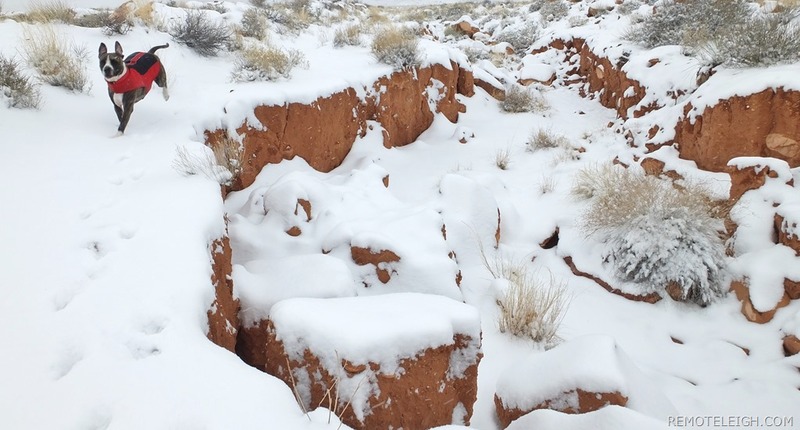 It made me wonder; how much snow could we expect in Vermilion Cliffs? Six inches, eight inches, a few feet? I didn’t care, bring it on! 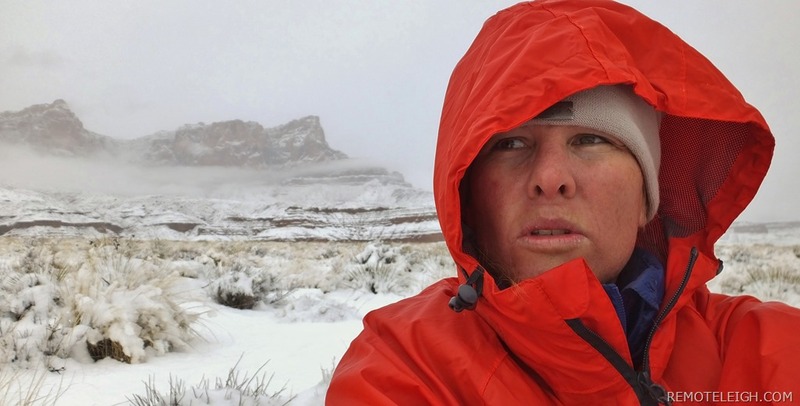 I felt so fortunate to be hiking in a desert snowstorm. After less than a mile on trail, we found ourselves in the eye of the storm. 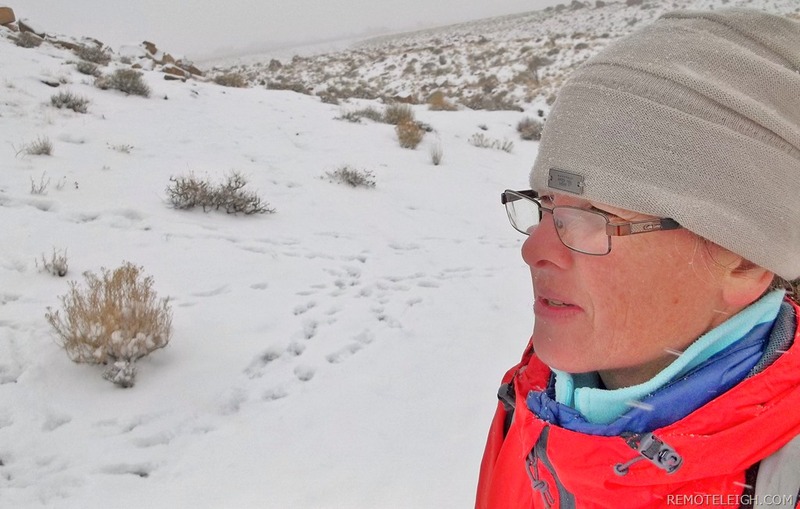 The snow was falling at over an inch an hour and the wind was starting to howl. Shadow didn’t seem to mind, perhaps he felt like a seasoned snow dog after his white Christmas encounter. Halfway up the cliffs,` we decided to take a break and shoot some pictures. The storm was now in full force, white out conditions were looming. Late in afternoon, Min broke the bad news to Shadow. How do you tell a dog it’s time to go home? You don’t, you just start walking! Taking one final view into the canyon, Shadow, Min and I made a beeline for the house. Leading the way and setting the pace, Shadow ensured our return in record time. Maybe Shadow was keen to get home and warm his paws by the heater. Less than a hundred yards from the house, I turned around to look at the cliffs. I was awestruck! There were no words to describe the view. 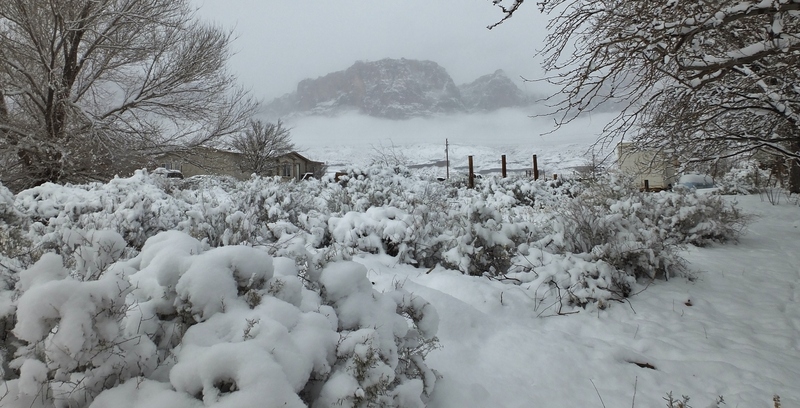 Not even in my wildest dreams, could I have ever imagined a desert winter wonderland on New Year’s Eve. Neither could Shadow for that matter! By definition; a White Christmas is having at least one inch of snow. Statistically speaking, the chances of having a White Christmas is 60% or better over the Northern Rockies, the Northern Great Plains, the Great Lakes, and most of New England. If you live in the southern third of the country, your chances of seeing snow are less than 20%. Living at an altitude of 4,000 feet, I looked to the town of Jacob Lake for a White Christmas. A scenic forty-minute drive to Jacob Lake would not only double my altitude, but also increase my chances of snow. 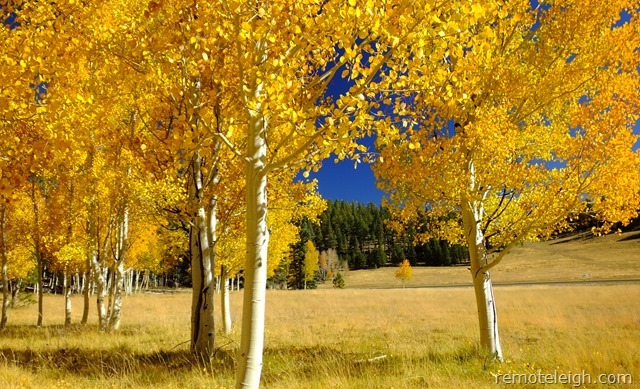 Jacob Lake offered an escape from the desert heat in the summer and glowing aspens in the fall. I was hopeful Jacob Lake would complete the trifecta of my seasonal experience, by giving Shadow his first snow encounter and a white Christmas. Before retiring to bed on Christmas Eve, I chatted with the perfect stranger and checked the weather forecast. 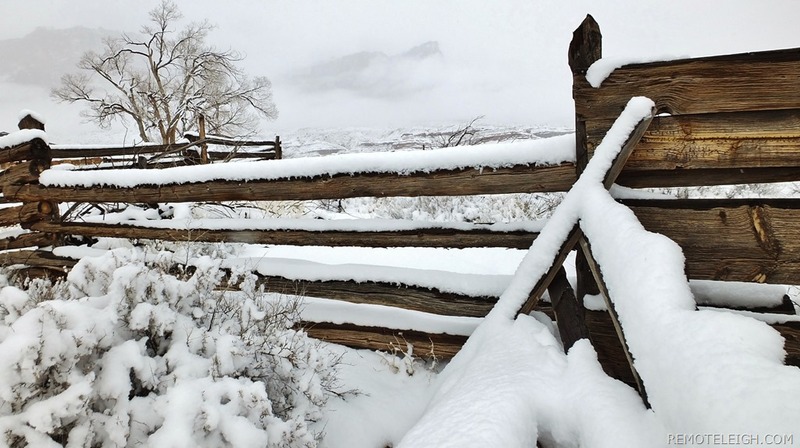 The overnight temperatures were expected to drop below 30 degrees with a 50 percent chance of snow. I felt the odds were in my favor; White Christmas here we come! On Christmas Day, a sleepy-eyed Shadow and I headed out to the kitchen to make the morning coffee. From the back window, I could see the clouds hovering over the cliffs. 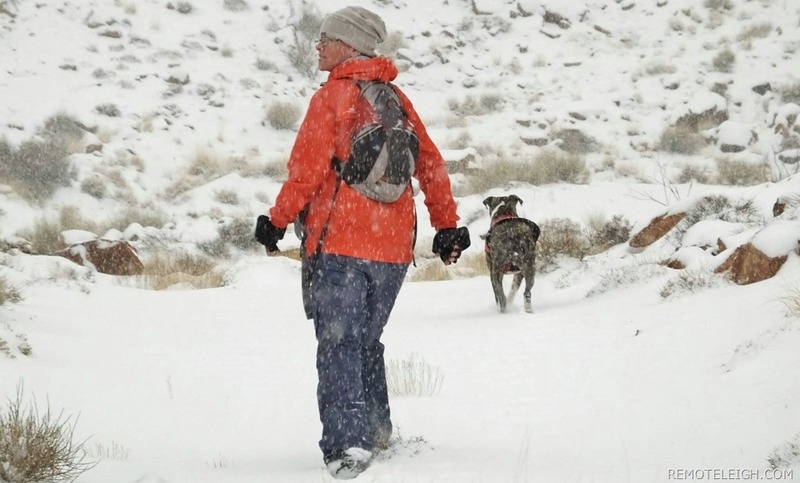 The temperature felt colder than usual; it was starting to feel like snow weather. By mid-morning, the view from my front porch was nothing but grey clouds. 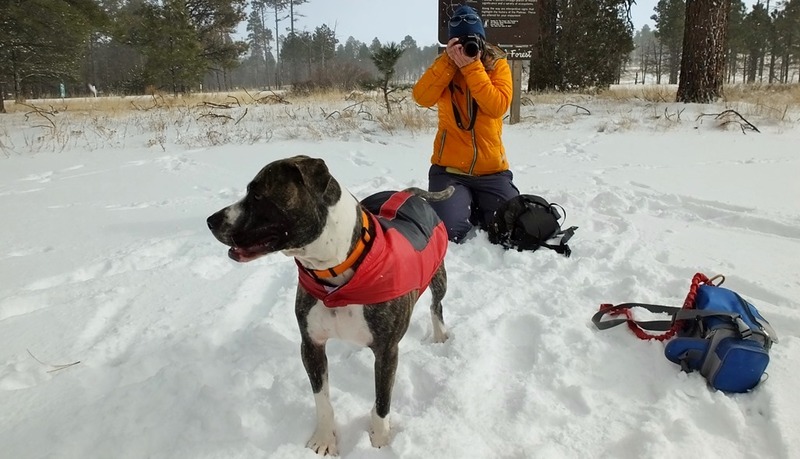 A final weather check reported snow flurries on the Kaibab Plateau and up to four inches of snow at Jacob Lake. 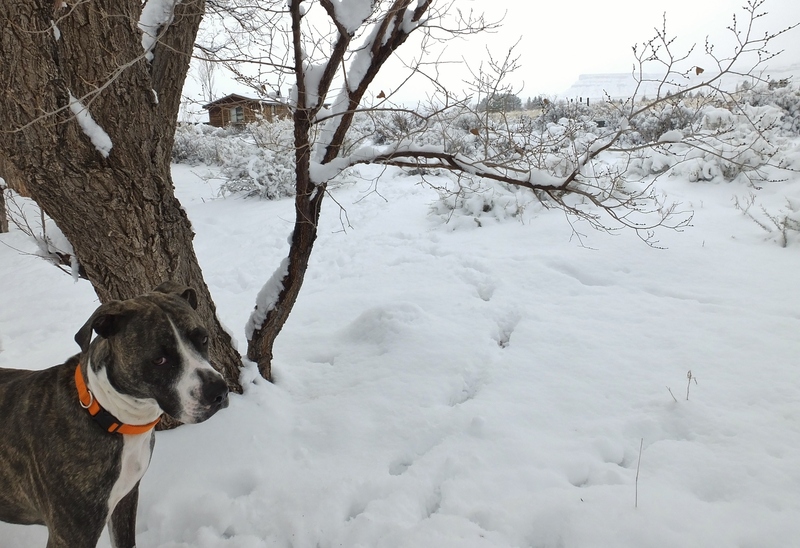 It was official; a White Christmas for Shadow! 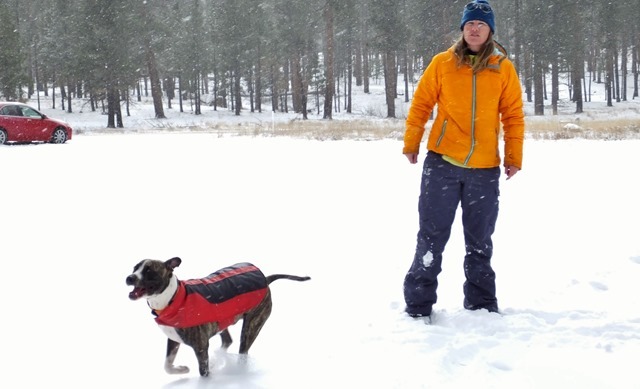 Outfitted in snow gear, Min, Shadow, and I left Vermilion Cliffs bound for Jacob Lake. 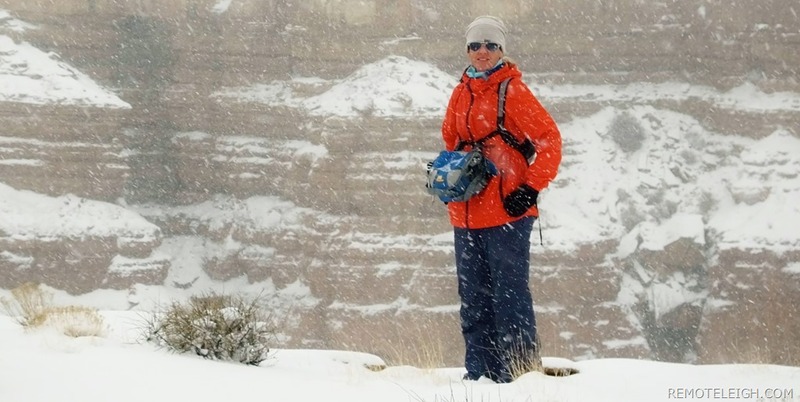 Ascending over 3,000 feet, we traded the desert valley floor for a snow storm in the Kaibab National Forest. The snowy road conditions caught Shadow’s eye. 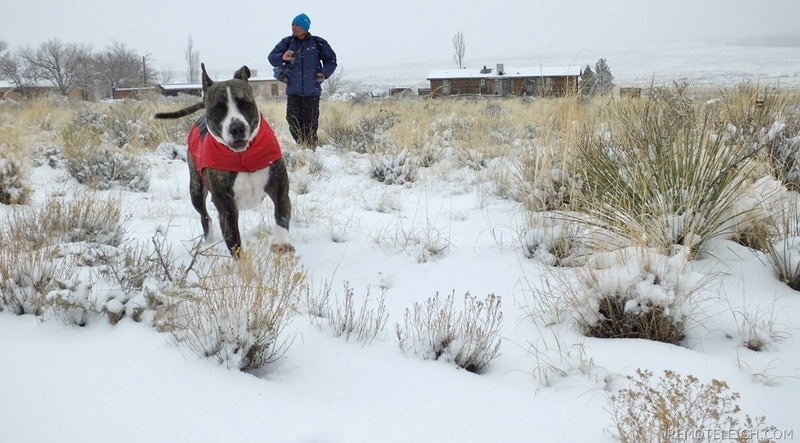 He had never seen snow before, but it did pose the question: do dogs have an understanding of weather? Shadow was not a fan of hiking in the rain, yet he had no problem swimming in the cold Colorado River. Would Shadow enjoy the fresh snow under his paws? Well, we were about to find out! I am not sure who was more excited, Shadow, Min, or me! 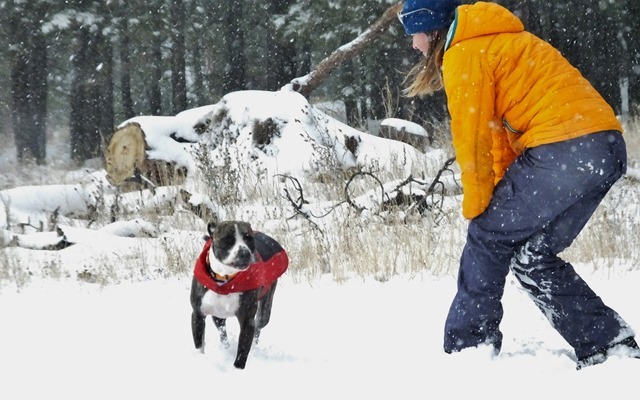 Dressed in his Michael Jackson Thriller vest, Shadow galloped through the snow. Min and I took turns playing photographer, as we both wanted to capture Shadow’s first snow experience. While Shadow continued to run himself ragged, thoughts of the perfect stranger ran through my mind. Had it only been one week since we said our goodbyes at Kingman Airport? Would you believe we had talked on the phone every day since? Call me selfish; it wasn’t enough! I needed to see her. I missed her company! 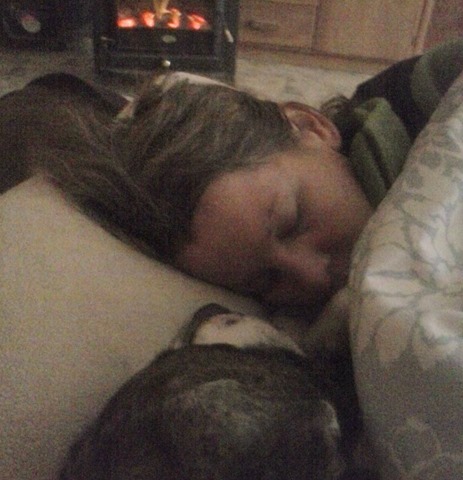 Even though I felt fortunate to be spending Christmas Day with my family; Min and Shadow, it felt incomplete. My special someone was a few thousand miles away and it was snowing. I wanted to share my White Christmas experience with her too. 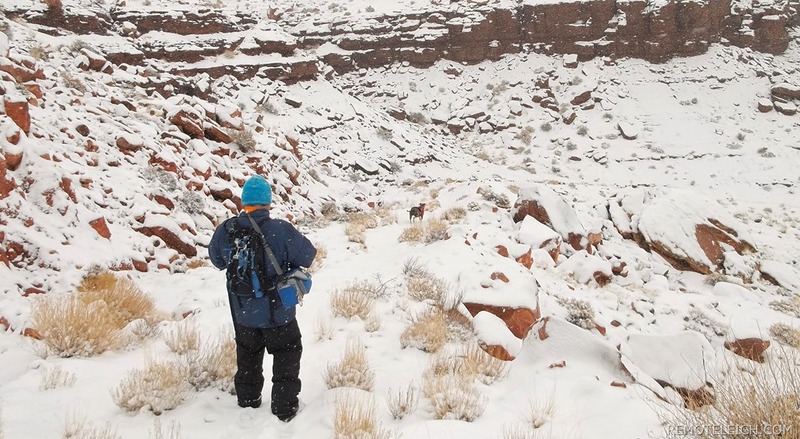 With the snow continuing to fall at an inch an hour, Min and I decided to head back to Vermilion Cliffs. Neither one of us wanted to get stuck or stranded in the snow storm, although Shadow wouldn’t have minded. How do you tell this face it’s time to go home? 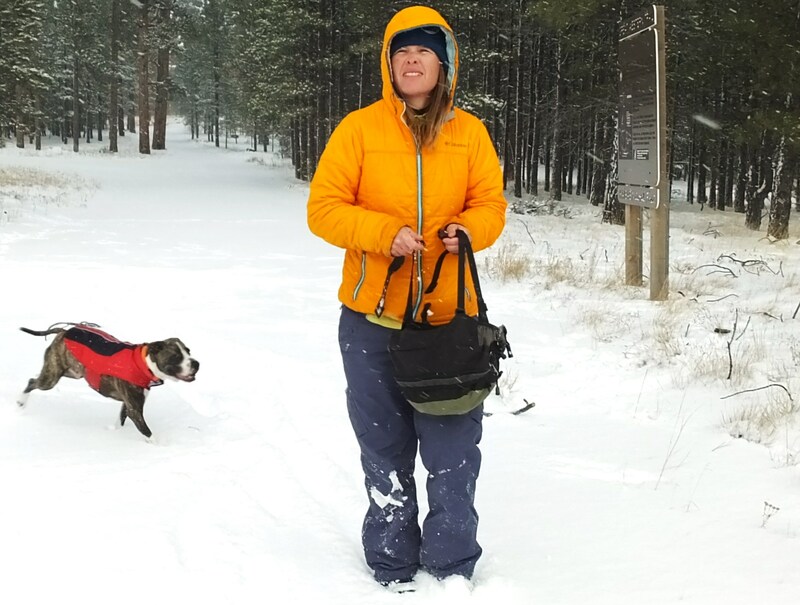 As Min headed to the car, Shadow and I enjoyed our final run in the snow. Shadow was a natural in this winter wonderland, and I could only hope for more snow opportunities in the New Year. 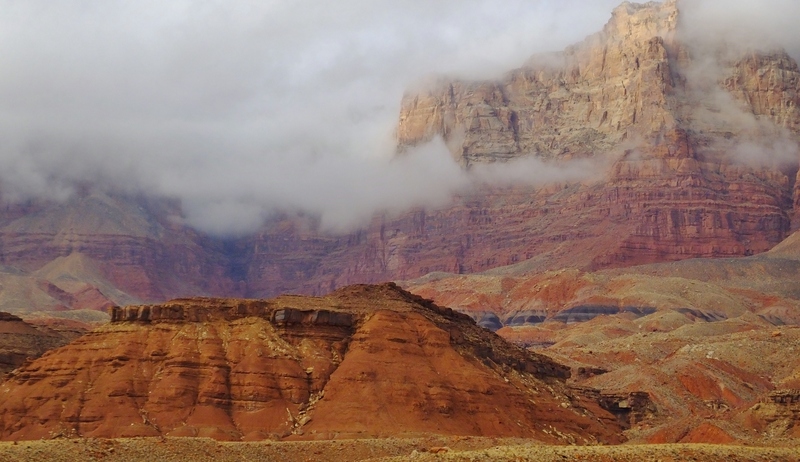 Perhaps Mother Nature could overnight a winter storm to Vermilion Cliffs. Ideally, she’d deliver several inches of snow to my desert front door. 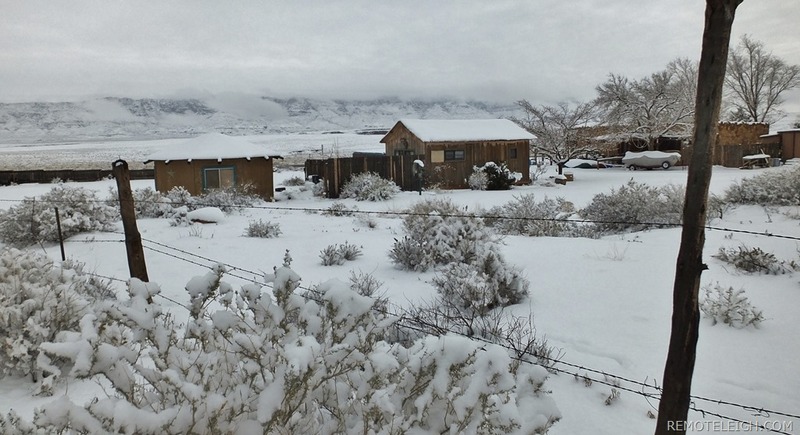 I wanted to experience a desert winter wonderland! Walking back to the road, I had so many questions running through my head. I wondered if Shadow would remember the sensation of snow under his paws. 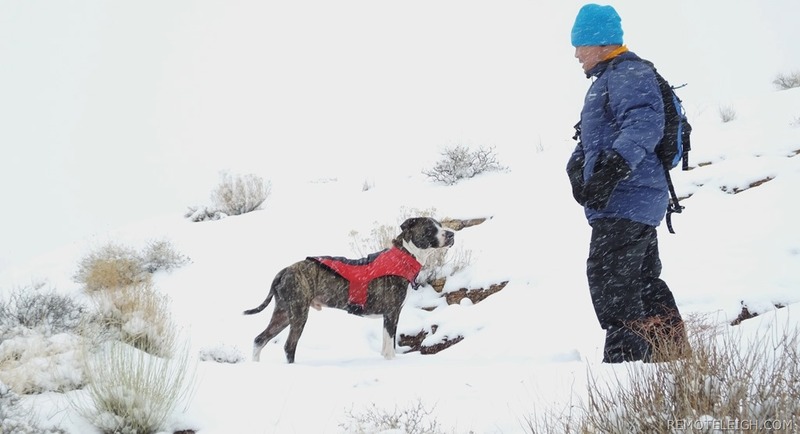 Would Shadow and I get the opportunity to share some winter adventures together? When would I see the perfect stranger again? How would I spend my winter break? None of my questions required answers; I was content to let life happen. 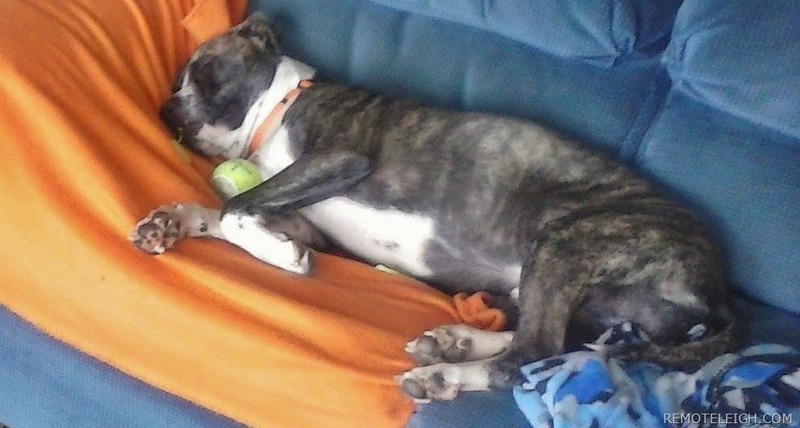 Letting life happen is a lifestyle that dogs model for humans on a daily basis. A dog owns nothing; they live in the moment, yet they seldom seem dissatisfied. Companionship is their currency to happiness. In recent years I’ve had friends tell me they are more likely to find companionship with a dog than with a human. It makes me wonder, has human companionship become such a foreign concept that we fear it as much as loneliness? Is it our lack of companionship that places the focus on consumerism at Christmas? Has Christmas become more about giving presents than offering our presence? 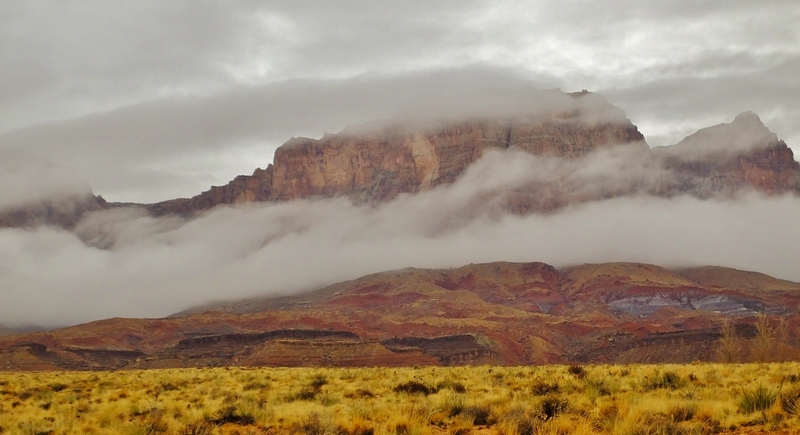 I returned home to a clouded in Vermilion Cliffs. With the temperature dropping, I grabbed a hot shower and heated up some homemade soup. I spent the rest of my day camped out on the porch. Yes, this was how I spent my Christmas.